The unobtrusive and safe way to hang plates. Sturdy brass wires with clear protective sleeves for scratch-proof use. Hook and nail included! 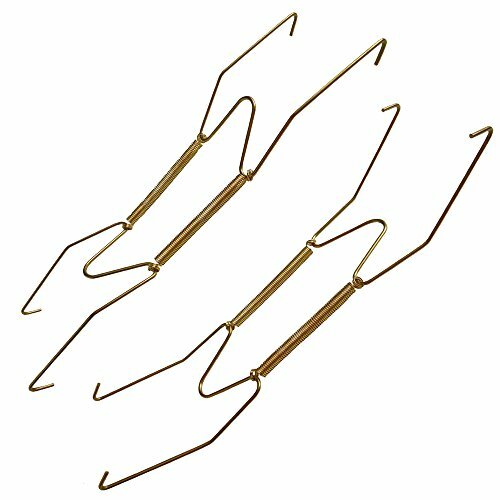 Package of 4 pcs This is the most popular size hanger! 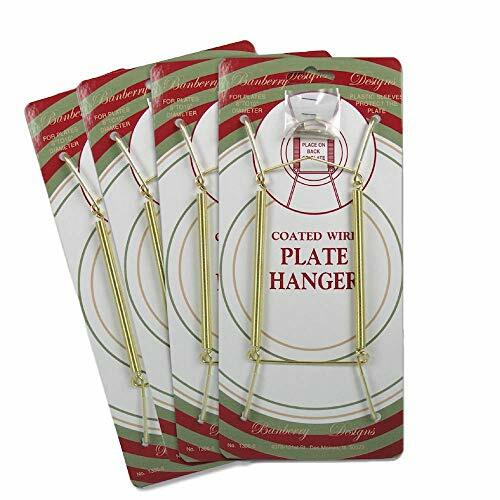 POPULAR SIZE This most popular size of plate hanger fits most collector plates 8" to 10"
Extra strong Super Plate Hangers are made of heavy gauge wire with a white vinyl coating. They're ideal for large plates, platters and plaques. Can hold items up to 4.5 lbs. holds up to 4 1/2 lbs. Great for holding plates,photos,and pictures. Wall mountable or table top display. Dual mounting holes in the back. No mounting hardware included. Deluxe Plate hanger holds your most treasured plates securely. 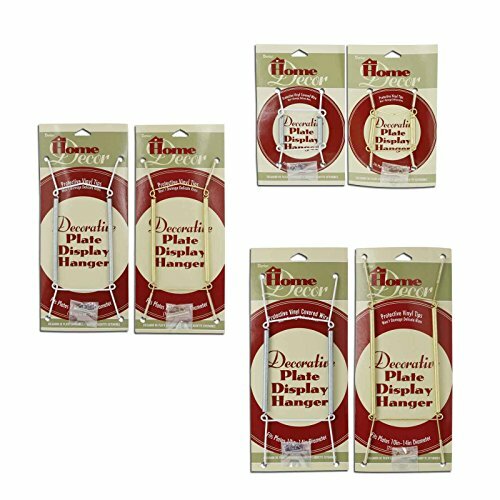 Also includes a 30 lb professional picture hanger for easy installation. Easy to use and helps to decorate around the home or office. Available in a various sizes. Our Augusta Plate Rack will beautifully showcase special plates or tiles. It features a square wire construction with Black Finish and scroll metal design on both ends. 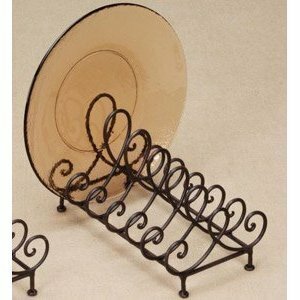 Store up to six dinner plates right on your counter or table top with this Wrought Iron Plate Holder. 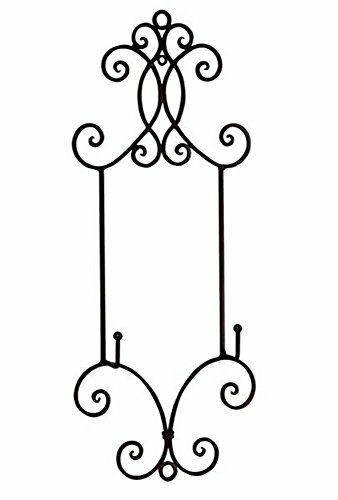 This plate holder stand is constructed from sturdy wrought iron to provide a classic rustic accent for your kitchen that will endure for years and years to come. 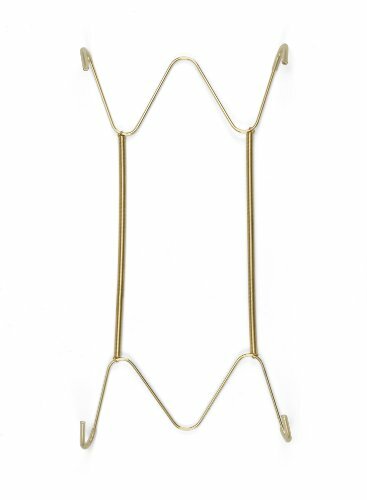 Featuring an elegant Baldwin arch design these metal plate holders are great for displaying decorative plates or for providing dishes at a buffet. Wrought Iron Plate Holder Features Constructed from durable stainless steel to provide a lifetime of beauty and reliability. Beautiful Baldwin arch design adds classic style to your kitchen decor. Holds up to six plates. Great for setting out dinner plates salad plates and saucers at a buffet. Provides a stylish way to display a collection of commemorative plates. 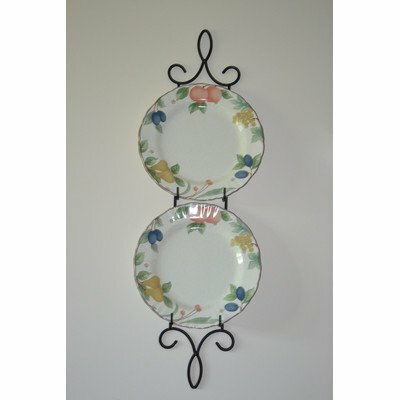 This decorative plate stand provides your kitchen with a touch of classic style as it adds to the convenience of serving buffet style dinners or displays collectable plates where they can be seen and enjoyed. Constructed from durable stainless steel to provide a lifetime of beauty and reliability. Beautiful Baldwin arch design adds classic style to your kitchen decor. Holds up to six plates. Great for setting out dinner plates salad plates and saucers at a buffet. Provides a stylish way to display a collection of commemorative plates. 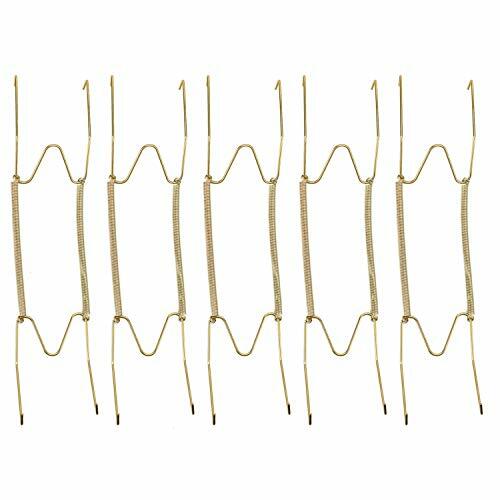 Jandj wire has created their newest single, double and triple plate racks to complement any d cor. display your most cherished plates securely to any wall with our unique design. vertical holders come in three sizes that will fit one two or three 8" to 10" plates. sturdy wrought iron is cured under heat to produce a durable black powder-coat finish. this item is proudly designed and made in the USA. no assembly is required. plates and hardware for mounting is not included. 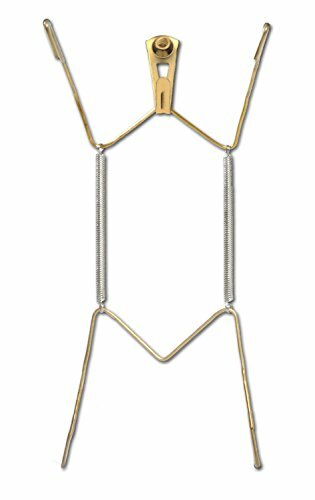 dimensions for the double plate rack are 33"l x 7"w x 3"d.
Brass finish plate wires accomodating 15-30-inch plates. 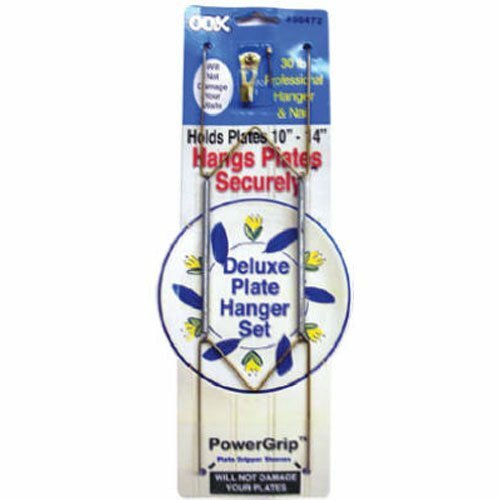 The unobtrusive and safe way to hang plates. Sturdy chrome wires with clear protective sleeves for scratch-proof use. Hook and nail included! 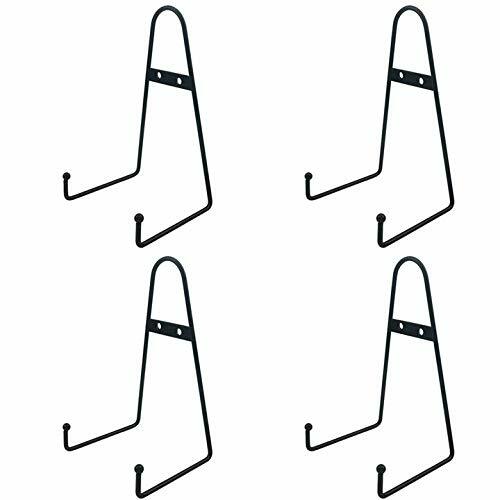 Pack of 4 hangers. Made of high quality stainless steel with golden color plated on the surface, hard and durable, not easy to get rust or erosion. 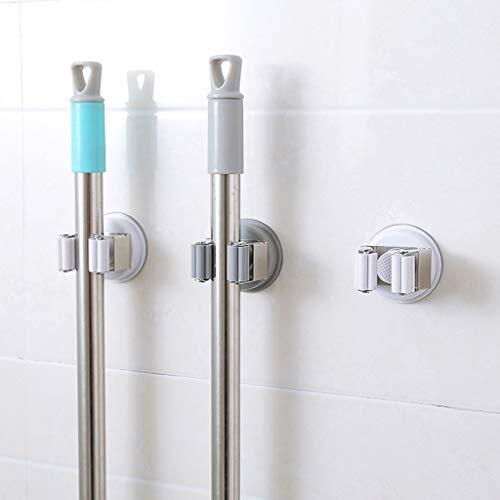 The plate hangers and hooks are almost invisible from the front, expandable length springs. Lightweight, convenient and practical using in daily life. 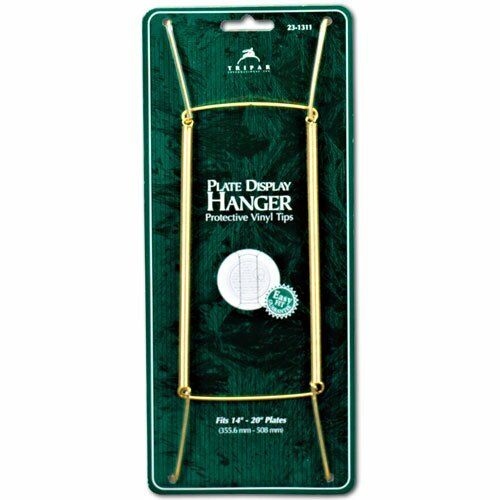 The hanger is easy to assemble to use. 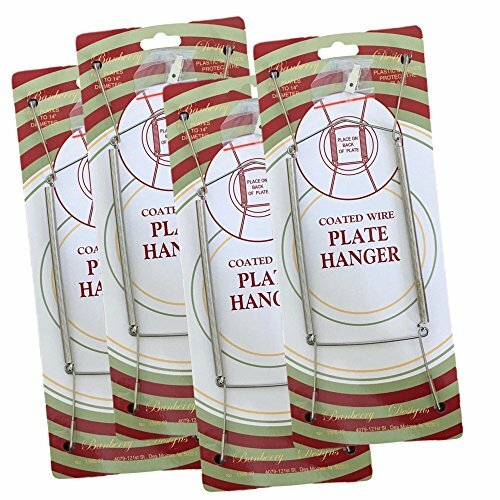 If you are looking for a hanger to hold your plate, this gadget will be your bestchoice. 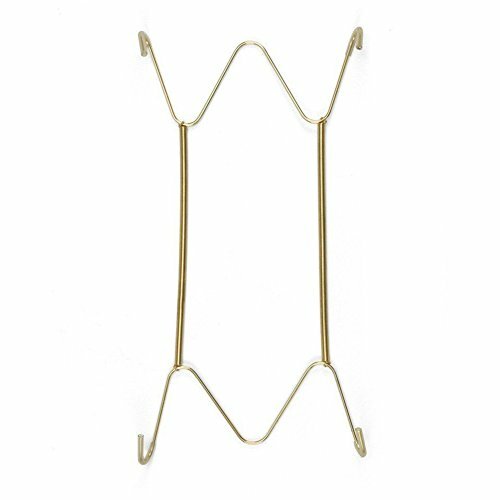 Material:made of stainless steel material, hard and durable; With gold-plated surface, not easy to get rust; Featured with expandable springs, maintain strength to secure plates. Fit for 11 to 13 inch round or square decorative plates. Expandable Adjustable Length Spring Easy installation. 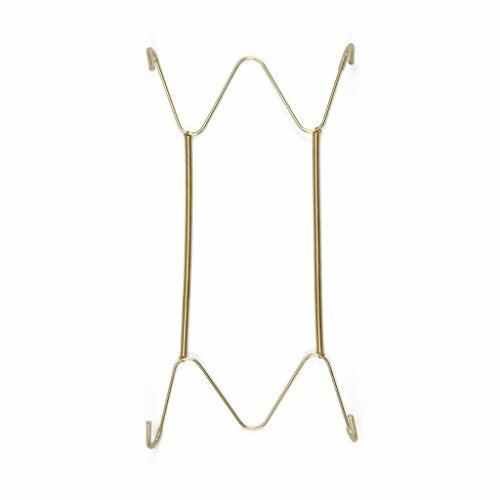 Application: the wall dish hangers and hooks are almost invisible from the front, good for decorating porch, wall and holding plates. BSET SERVICE: We are committed to creating the best customer service of our product. If you are unsatisfied, contact us. You will receive a 100% refund and lifetime warranty. Protective vinyl tips and sleeves will not scratch plate surface. This plate display is unobtrusive, leaving the decorative plates as the centerpiece. 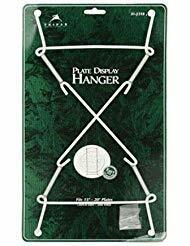 The plate hanger comes with wall mounting bracket for easy display on a flat wall. Lacquered brass wire resists tarnishing and looks beautiful. Our Business - Dirance is a comprehensive store mainly focus on Apperal, Toys And Home &Garden.More information welcome to Click Dirance. Our Logistics - In general, you can receive your lovely item during 7-14 days for product above 5 dollars and 15-28 days for the product under 5 dollars.